Details are now out and the entries can now be submitted. Live in or have a home address in the Southland province or in the Queenstown, Glenorchy, Arrowtown, Tapanui and Heriot areas. Complete the entry form by clicking the REGISTER button below and email your entry to dandavin@xtra.co.nz by 5.00pm on 28 July 2017. ​In a change from previous years, writers in the Junior and Under 19 sections do not need to get a teacher to sign their entries. 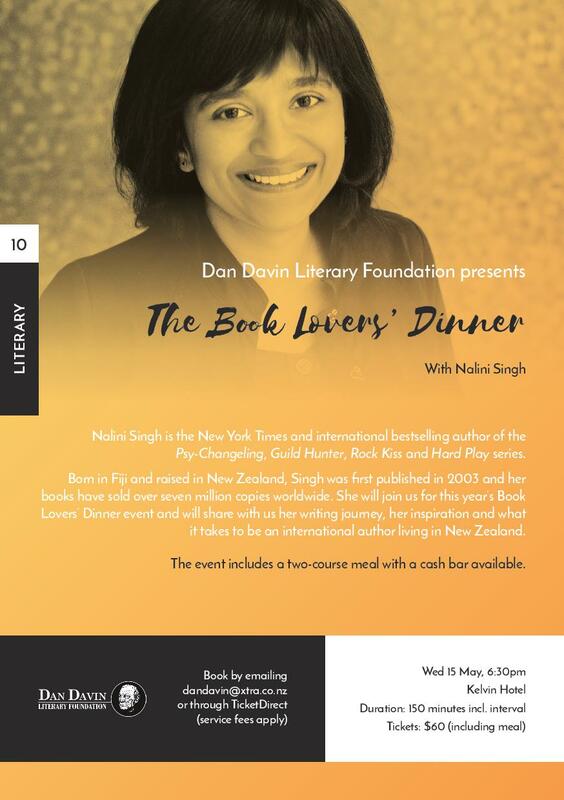 Adults must pay a $5.00 entry fee by post to Dan Davin Literary Foundation, PO Box 29, Invercargill 9840 or by bank transfer to 03-1746-0078140-000. Please put your name in the particulars. There is no entry fee for the other awards. Entries must not defame any person or corporate body nor infringe or breach any rights of copyright. 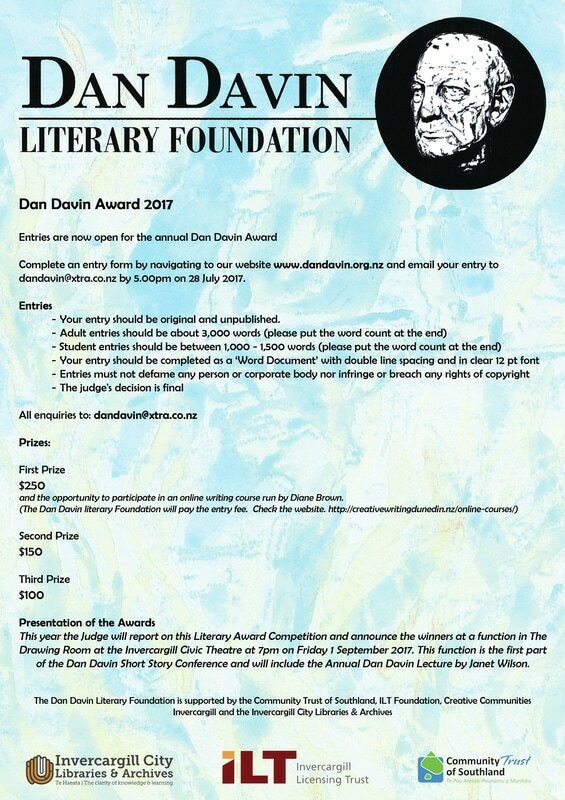 The Dan Davin Literary Foundation reserves the right to publish any place getting writing entered in the competitions. We have a number of sponsorship or funding opportunities available. The Dan Davin Short Story Conference appeals to a wide range of people from throughout New Zealand. We have speakers coming from all over the country as well as delegates. These attendees are largely writers or academics. Many of them host blogs or writing related websites. Our aim is to provide them with a unique Southern experience that inspires them to write about Southland and their experience here either through online means or as part of their writing. As a supporter of this conference there is an increased opportunity of attendees acknowledging your support. We have 4 keynote speakers attending the conference – Janet Wilson, Owen Marshall, Dame Fiona Kidman and Tracey Slaughter. Each requires accommodation whilst in Invercargill and travel to get to Invercargill. For $700 you could be a Speaker Sponsor. The opportunity to be named in the Dan Davin Short Story conference programme ie Owen Marshall presented by (Business Name). This will also include promotion via our Facebook page and advertising. You will receive one free registration at the conference (Valued at $200). You will be able to have a display space or pull up banner displayed in the main auditorium. We are also looking for product sponsors to help cover general costs of the conference. For $200 you could be a product sponsor. You will be able to provide an item for the delegate registration pack. You will be acknowledged in our printed material and through our Facebook page promotion. We are offering delegates the opportunity to enjoy the best Southland has to offer including a bus trip to Bluff and Riverton and organised tours. Funders will be acknowledged for their contribution to the conference. We are happy to discuss other opportunities to have you involved in the Dan Davin Short Story conference if these options do not suit you. We are happy to answer any questions. Thank you very much for considering our proposal. 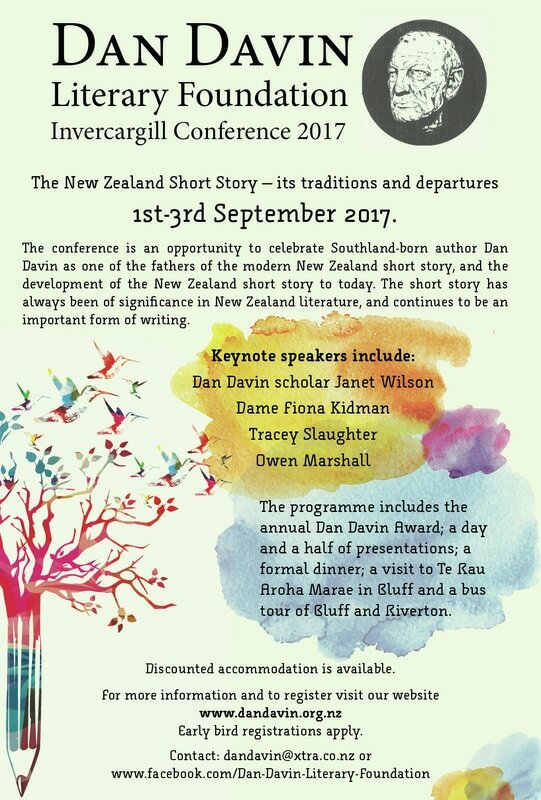 The Dan Davin Conference on the New Zealand Short Story – its traditions and departures – will be held 1st - 3rd of September, 2017. The conference is an opportunity to celebrate Southland-born author Dan Davin as one of the fathers of the modern New Zealand short story, and the development of the New Zealand short story to today. The short story has always been of significance in New Zealand literature, and continues to be an important form of writing. Some of New Zealand’s foremost writers of the genre including Owen Marshall, Dame Fiona Kidman and Tracey Slaughter will attend. Janet Wilson will be key note speaker. It will be the first conference for many years devoted entirely to the short story and its place in New Zealand literature. We are able to provide discounted accommodation at the central city Kelvin Hotel and Ascot Park (outskirts). If you arrive early on Friday we can provide discounted passes to Bill Richardson’s Transport World and the Classic Motorcycle Mecca. And if we have adequate interest we can also provide discounts to visit Stewart Island on Monday 4 September. Dunedin’s University Book Shop will be the Dan Davin Short Story conference bookseller with copies of speaker’s works and the ability to take orders. 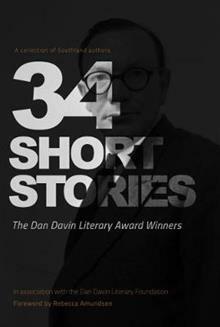 The Dan Davin Conference on the New Zealand Short Story: its traditions and departures – will be held in September. The conference is an opportunity to celebrate Southland-born author Dan Davin as one of the fathers of the modern New Zealand short story, and the development of the New Zealand short story to today. In conjunction with the Dan Davin Annual Lecture, the two-day conference will be held in Invercargill from September 1-3. Author Vincent O’Sullivan is working with the Foundation to develop the conference programme. The short story has always been of significance in New Zealand literature, and continues to be an important form of writing. Papers of 25 minutes are invited on any aspect of the tradition, its contemporary practice, and on the work of individual writers. Some of New Zealand’s foremost writers of the genre including Owen Marshall, Dame Fiona Kidman and Tracey Slaughter will attend. Janet Wilson will also be key note speaker. It will be the first conference for many years devoted entirely to the short story and its place in New Zealand literature. The conference will include an opportunity to experience the unique south, as well as attend the events which will be held in two outstanding southern venues. We also welcome expressions of interest of attending the conference and can provide assistance with discounted accommodation..